What difference does a website make? Coming up: the Society for Literature, Science and the Arts annual conference in Indianapolis (28-31 October), the Reimagining the Archive conference at UCLA (12-14 November), and a two-week stay in San Diego (UCSD) in the middle. I’m looking forward to all three! The first talk, in Indianapolis, will focus on the production, handling, and dissemination of images of art at the Rijksakademie for the visual arts in Amsterdam – a setting where new, networked technologies blend with existing documentation practices. I am interested in the entanglement of images and art works with the institute’s image database. In addition, I focus on how the visual documentation relates to the complex experience of making/seeing art objects. And how do these documentation practices relate to other electronic settings and networks in which the images might circulate (artist’s website, Flickr, sites galleries, etc.)? The talk at the science studies colloquium at UCSD will center around our project label “Network Realism:” a new form of visual knowing, taking place at the intersection of digital images and computer networks at the point where they purport to convey the ‘real’. I will discuss results from our fieldwork at four sites where network realism is central: the Rijksakademie for the visual arts; the Tropenmuseum (an ethnographic museum); real estate database Funda; and Flickr as used by scholars who study street art. At each of the fieldsites, images are part of databases and circulate in complex electronic networks in ways that are not reducible to, but are intimately related to their digital format. The manipulation of digital images in networks enables other kinds of knowledge than those possible by physical co-presence with the objects represented. At the UCLA conference, our contribution will focus on networked knowledge and epistemic authority in the development of virtual museums, based on the fieldwork pursued at the Tropenmuseum. In light of the popular claim that new technologies will radically reconfigure existing socio-technical relations and dramatically alter the basis for scientific and scholarly authority, we will argue that it is important to draw attention to emerging forms of epistemic authority in relation to pre-existent institutional and infrastructural elements. Sarah and I attended a very interesting meeting at the Hermitage yesterday, Kom je ook? 2 (preceded and followed by other Kom je ook? meetings). From the 350 curators, new media designers and artists and cultural sector actors who attended, many already reported on twitter, Facebook and Flickr on the event, which leaves me to add here my own reactions. The audience was promised an afternoon free of techno-enthusiasm, and given the means to punish any offending speaker (toeters were handed out at registration). And indeed, there was little of that kind of talk. There was, however, a strong tendency to focus on platforms, and to draw out their design advantages (several fantastic-sounding tools were shown). We heard very little about actual uses and users, about variations and creativity in the way the platforms were used, etc. With the exception of Gillian Moore who spoke eloquently (but somewhat generally) about the values needed for creating relationships with audiences (honesty, respect, integrity, commitment, innovation), there was little about people and meaning and interaction. So I came away feeling there was a big role for social science and cultural studies to fulfill in this emerging arena. For example, we can provide a vocabulary to talk about the kinds of engagements with cultural institutions, via these platforms. The words community or audience were mentioned once in a while, but these terms are very broad and general. It gets you about as far as talking about a museum collection as ‘containing paintings’, or saying of a website that ‘it has hyperlinks’. True and relevant, but quite poor as a way into a good description and real understanding! 1. surprises–ways in which their tools/sites/platforms were used in unexpected ways, and by whom? 3. new skills–the issue of needing new expertise and to dedicate human power to developing relationships came up several times yesterday. Might this also be true of visitors and audiences? Are they developing new skills and new knowledge? Yesterday and today, I joined in on a Crossmedia workshop for employees of the Tropenmuseum, Tropentheater, and Tropenmuseum Junior, led by Jim Stolze and Rob Prass. Among other things, participants were introduced into the world of Twitter, RSS, blogging, Igoogle, learned why the sender-receiver model of communication is no longer applicable, how to the museum can get into Google’s top 3, etc. To most of the participants, this was all new information. The museum is not an early adopter, and needn’t be for that matter, but most employees seem eager and interested to engage in and with these new technologies and find out how they can be of use in the museum or theater. This is part of the group, as photographed by Rob. Doesn’t look very interactive, but that’s deceiving. The group was also invited to brainstorm sessions, for instance about how to put visitors first, take their perspective, seduce them into informed (‘coming from experts’ ) story-telling experiments via new media. It was the second time the workshop was held. The first time around, I learned, one of the ideas that came out of the brainstorm session was the ‘Object of the Month‘. On the museum website, visitors are invited to help the museum find out more about the object. The object itself is also displayed in a showcase near the entrance. Unfortunately, I can’t be there for the afternoon session, when the new ideas are presented. 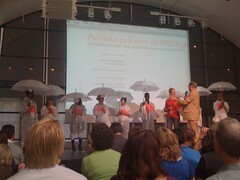 Anne and I are attending “Kom je ook? 2” at the Hermitage, a symposium about innovation and participation in art, culture, and heritage. The Tropenmuseum is one of a host of cultural heritage institutes currently hopping on the Web 2.0 train. The museum wants to engage new audiences, and increase the number of visitors. The task to increase visibility on multiple platforms is taken pretty seriously. The museum has a multimedia producer, and has recently hired a new project manager for museum digitization. Naturally, it is their job to be interested in new media. But employees from other departments are also encouraged to reach out to users in new ways. Today, a first group of employees received an invitation to participate in a webcourse called 23 dingen voor musea. From September onwards, participants will be taught the basics of blogging, twitter, rss, social bookmarking, tagging, etc. I am very curious to see what this will lead to. A very playful example is set by the Brooklyn Museum, one of the leading institutes when it comes to audience engagement via new media. They recently came up with a game called Tag! You’re it!. First, you have to become a member of the museum ‘posse’. Once you’ve registered, you’re ready to play with objects in the museum database, displayed on the screen via a picture and a short description. Basically, the idea is that you tag images, and get as many matches as possible with existing tags. The museum website states that the tags are meant to help people find specific objects in te Brooklyn Museum collections. Increasing the visibility of the collection is of course an interesting goal. Still, if we also take tagging to be a way of creating user-generated content, tags could also serve another purpose. Who knows, perhaps the information could serve as input for the registration and documentation of the museum collection. On this note: Dutch readers may be interested in the evaluation the National Archives recently published on their pilot project with Flickr the Commons. The first two weeks of fieldwork at the Tropenmuseum have generated so much stimulating new information, that it is hard to choose out of many possible topics. For now, I’ll stick to the event described in Anne’s earlier post: the photo competion WikiLovesArt/NL. The basic idea, as Anne already mentioned, is that people make photographs of objects, art works, etc. in the participating museums, and upload them to Flickr. Some of the best photos will be placed on Wikipedia pages, but there are also other rewards (for instance, 500 euros worth of photo equipment). The idea is that participants upload their photos to their Flickr account under a Creative Commons licence. Subsequently, they become members of the Wiki loves art Flickr group, and place their photos in there. A jury, consisting of the organizers and employees of the museums, decides which photos will be used for the Wikipedia pages (I’ll dedicate another post to this jury system). The Tropenmuseum is also participating. Indeed, a lovely intersection of two of the project’s case studies. At the time of writing, 130 out of 866 photos in the WikiLovesArt/NL pool are tagged with Tropenmuseum. This is one of them, by 23dingenvoormusea. Another participant commented on the photo, asking 23dingenvoormusea how s/he managed to photograph the drum through the showcase glass without reflections. The discussion that followed is an excellent example of how users shape what they take to be ‘realistic’ representations of the object. Interestingly, using Photoshop to get rid of reflections, and to enhance contrast, white balance, and sharpness, is considered as legitimate, even neccessary, in order to get at the real. I’ve been spending some time with the museum photographers. They discuss each other’s work as well, for instance the lighting conditions, providing the objects with the ‘right’ shadows, etc. This photograph was taken in their studio, not in the museum. I think the photographer in this case deliberately chose to photograph the object from this particular angle, to bring out the shape of the object itself, and of the geometrical marks and carvings of trees, people etc on the drum/woman’s belly. This said, looking at this photograph is quite different from the experience of looking at the Flickr photograph, also due to its different context, not to mention the difference with seeing the object in the museum itself, amidst other objects, beautifully lit, etc.